And on that note we shall say goodbye. More from Newcastle boss Rafa Benitez: "We didn’t start well, didn’t do what we have to do at the start. We conceded two goals at set pieces that we could have avoided easily. We had attempts in the first and second half, but it’s difficult when you are 2-0 down already and exposed in the counter attack. "We were analysing set pieces, knew what could happen but we made mistakes. We must learn for the future, starting against Everton. "The reality is we were doing well away, then we have good games at home. The disappointment comes from that, today we started very poorly." West Ham captain Mark Noble: "We are really pleased, we started really well and then could have had a few more. "We deserved the points, there was some fantastic defending and that's what you need. Teams are so good now they will create chances against you. "You could feel the atmosphere before the game, the crowd was exra loud. I know Billy Bonds quite well and he is a fantastic person and was a fantastic player. Everyone can look to him as an example for the football club. "It was a great occasion, I can assure you that I won't be getting anywhere near his number of appearances! I am not going to reach 800..."
Newcastle boss Rafa Benitez: "We made our own mistakes, started with a lack of concentration and conceded two set pieces to a good team. We still had 17 attempts and they were a bit lucky with some of their blocks. "The second goal was a free kick that we knew could happen. When they have this quality up front you know you can be punished. "When you go away and have 17 attempts you have to score at least one goal, but it’s not easy when you are 2-0 down too soon. "We are where are, we are doing a lot of good things but we must keep focus and concentration from first to last minute. "We have to be sure we learn from these mistakes and prepare for next game." West Ham manager Manuel Pellegrini: "We are very happy, we played a good game and were a solid team. The way we attacked and tried to play as far from our box as possible, we played at a good level which is so important. "Manuel Lanzini played for 90 minutes for the first time, my idea was for him to play for 65, 70 minutes but he was telling me that he was feeling good." Rafa Benitez says that midfielder Sean Longstaff came off with a knee injury. Newcastle winger Matt Ritchie to Sky Sports: "It was a fair result, we did not start well enough and were not ourselves in the first 20 minutes. The distances over the pitch were not good and we were punished. "It’s so frustrating as we were performing at a high level. Hopefully it’s a blessing in disguise, as if you need a wake up call, this was it. "Away from home you hope to frustrate and stay in the game, wait for it to open up after the break. But we conceded early and we didn’t know if to stick or twist in the first half. It’s frustrating. "We moved the ball OK after the break, got in good areas but didn’t manage to have the cutting edge. "If there was any complacency sliding into the dressing room, this will put that to bed. The next one’s a big one." West Ham midfielder Declan Rice on Sky Sports: "We knew Newcastle have been in great form recently and we had to treat this as a final. We were out of the blocks quickly, played some lovely stuff but after half time knew they would come back strong. "My goal was massive, it was nice nice to get on the scoresheet, as I missed a sitter against Liverpool. "It’s a really important win, this season we have made it tough for teams to come and play here, especially the top six. We need to play well and get the fans behind us." "I hope so, nothing is given in the Premier League and it is tough for spots. I am just keeping focus on West Ham, and if I get the call I would be delighted." Despite being West Ham’s top scorer in the Premier League this season with eight goals, Felipe Anderson has failed to score in his last 10 games in the competition now. West Ham midfielder Declan Rice says he "hopes" to be in the running for the England squad when it's announced next week. Manuel Lanzini announced as man of the match, certainly had a good game in the midfield. He was never tightly marked by any one in particular in Newcastle colours. I thought Declan Rice was very good in the first half. It was a team effort. They have been a bit more purposeful and certainly more dangerous when they got to the final third of the pitch. 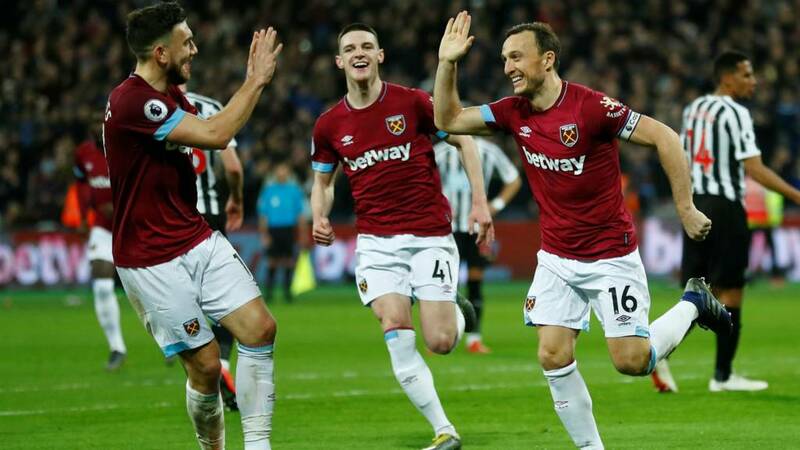 For the first time since they moved in, West Ham have claimed five consecutive league wins at London Stadium! Newcastle, meanwhile, fail to make it three wins on the bounce. Newcastle are faffing about and they really don't have time for that. At the other end, Martin Dubravka has to scoop down low to deny Manuel Lanzini. We've got three added minutes coming. Another minute passes, another yellow shown. Issa Diop goes in the book and West Ham concede a free-kick in a dangerous position. Salomon Rondon absolutely blasts it! It sends Fabianski sailing to his right but it looks like it comes off the post. Lascelles gifts possession to Felipe Anderson and West Ham have another chance. Robert Snodgrass picks it up in the centre of the penalty area and tries a nifty little backheel. It doesn't work, but effort was there. Then Lanzini is brought down on the edge of the box and earns a free-kick. Mo Diame is booked for tapping the West Ham man's ankles. No wait, goalkeeper Dubravka's been booked for protesting the free-kick! Newcastle sub Christian Atsu has made an early impression by setting up Rondon from the left. Rondon side-foots towards goal but Ogbonna gets an important block.